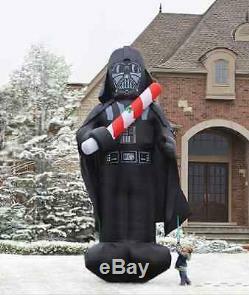 This is the inflatable Darth Vader that provides an imposing yet celebratory addition to an outdoor holiday display. Deploying as quickly as a lightsaber, Vader inflates with an integrated air pump that gives shape to his dominant form in minutes, suggesting the power of The Force has not yet exited his body. Constructed with shuttle-woven black polyester that forms his life-support suit, outstretched cape, and his iconic helmet, this reformed Sith lord bears a candy saber decorated with a holly berry ribbon as a token of his pledge to brighten his Dark Side with yuletide mirth. Six C7 lights illuminate the saber as well as provide just the right glow for his almost jet black outline. Four tethers and 10 stakes keep himas well as any inclinations to return to his less-agreeable waysfirmly to the ground. Plugs into AC with a 5' cord. 16' H x 83/4' W x 70 D. The item "Christmas Inflatable Star Wars Colossal 16' Darth Vader with Light Saber" is in sale since Monday, December 05, 2016. This item is in the category "Collectibles\Holiday & Seasonal\Christmas\ Current (1991-Now)\Yard Décor". The seller is "greatinflatables" and is located in Winchester, Virginia. This item can be shipped to United States, Canada, United Kingdom, Denmark, Romania, Slovakia, Bulgaria, Czech republic, Finland, Hungary, Latvia, Lithuania, Malta, Estonia, Australia, Greece, Portugal, Cyprus, Slovenia, Japan, China, Sweden, South Korea, Indonesia, Taiwan, South africa, Thailand, Belgium, France, Hong Kong, Ireland, Netherlands, Poland, Spain, Italy, Germany, Austria, Russian federation, Israel, Mexico, New Zealand, Philippines, Singapore, Switzerland, Norway, Saudi arabia, Ukraine, United arab emirates, Qatar, Kuwait, Bahrain, Croatia, Malaysia, Brazil, Chile, Colombia, Costa rica, Dominican republic, Panama, Trinidad and tobago, Guatemala, El salvador, Honduras, Jamaica, Antigua and barbuda, Aruba, Belize, Dominica, Grenada, Saint kitts and nevis, Saint lucia, Montserrat, Turks and caicos islands, Barbados, Bangladesh, Bermuda, Brunei darussalam, Bolivia, Ecuador, Egypt, French guiana, Guernsey, Gibraltar, Guadeloupe, Iceland, Jersey, Jordan, Cambodia, Cayman islands, Liechtenstein, Sri lanka, Luxembourg, Monaco, Macao, Martinique, Maldives, Nicaragua, Oman, Peru, Pakistan, Paraguay, Reunion.